Grotto Point Lighthouse is Stop 8 on the Spit to Manly Walk, as seen in the downloadable Spit to Manly Complete Guide and Map. The Grotto Point Lighthouse track junction is an optional detour off the main Manly Scenic Walkway. If you wish to take the detour, turn right for the lighthouse, or simply continue straight for Manly. If you are taking the Lighthouse track, follow it all the way to the end, and return the same way. The track goes to the lighthouse gate. There is a small rock ledge to the left that gives expansive harbour views. It’s difficult to get a good photo of the lighthouse, being so close, but the harbour view is worth the side trip if you have energy for a 20-30 minute diversion. A detour to the detour (!) can be found several hundred metres before the lighthouse. An unmarked track on the left goes to Washaway Beach. You would need to climb down a steep five metre rock section at the beach’s northern end. This unprotected beach is prone to large swell and not ideal for swimming. The sand is regularly washed away by big waves, revealing sandstone slabs. Despite not being a nudist beach, some bathers choose to reveal more than you may want to see. This white “Disney Castle” lighthouse, built in 1911 still operates. When the lights align with the similar-looking Parriwi Head Lighthouse, 1.6kms (1 mile) away near The Spit, ships know they are in the channel that will bring them safely into Sydney Harbour. Grotto Point has the distinction of being the first point inside Port Jackson, later to be called Sydney Harbour, to be mapped. It’s one of ten lighthouses inside the harbour. 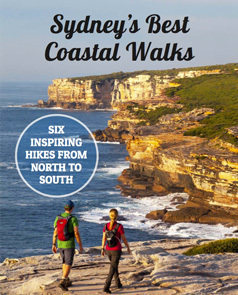 If you want to walk directly to the Lighthouse instead of the full Spit to Manly track, it's best to park near the end of Barrabooka Street, Clontarf and enter Sydney Harbour National Park from there. Keep going straight at the track junction, crossing over the main track to head down to the Lighthouse. Return to the main track the way you came, turning right to continue on to Manly. Walk up the stone stairs. Soon you’ll see a clearing to the right, marked by a small sign near a heavy-looking railway sleeper. This is the Grotto Point Aboriginal Engraving Site.